In my most recent post I stated that I firmly believe that knowledge of finance is a fundamental requirement for every small business promoter. 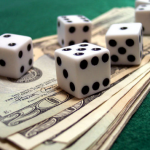 This is part two of two blogposts on Finance for Startups. The first post detailed my ten top finance related tips for startups while this post will now look at financing your startup and the finance landscape in Ireland. This article was inspired to some extent by an excellent slideshare on fundraising and bootstrapping by France Digital. 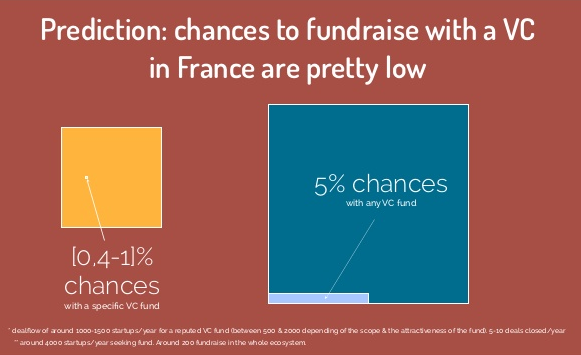 Slide 36 stated that there is a 5% chance of getting funding from VC ecosystem in France (4000 startups and 200 get funding). As an average fund closes 10 deals a year, there is less than one percent chance of your startup being funded by any particular VC. This got me wondering about the situation in Ireland. * A recent Enterprise Ireland press release focuses on how 1850 new jobs will be created over the next three years by 122 High Potential Start Up companies but a specific figure of how much was invested was not provided in the release. * Irish SMEs raised €285 million from investors in 2013, up 6% on the previous year according to the annual Irish Venture Capital Association VenturePulse survey published on the 20th February 2014. Over 95% of the funds in 2013 were raised by knowledge based companies covering software, medical devices, pharma and biotech. In 2013 funds raised from international players was €119m, an increase of 22% on 2012. 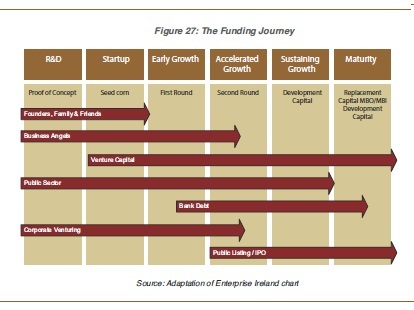 The IVCA publish a very useful Guide to Venture Capital listing VCs in Ireland – click here for 7th Edition. They also release a listing of summary details of all investments in Ireland by company in each quarter – click here for 2013 edition. BTW, Helen Cousins, Equity Finance Advisor (tech companies) at Xcel Business Solutions has produced a very good Slideshare on raising money in Ireland. 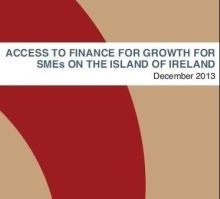 InterTrade Ireland published the very comprehensive Access to Finance for growth for SMEs on the island of Ireland report in December 2013.Their website states that the report provides a unique and reliable indication of the supply of finance for SMEs across the island and the level of their demand for finance for growth purposes. The report seeks to widen the debate from an important but narrow focus on the availability of bank finance to a broader discussion on the need for a more diversified financial ecosystem to support the need of growth-oriented businesses. A series of recommendations covering informational deficits, improving financial capability and diversifying the financial product range are included in the report. • SMEs have a ‘disproportionate reliance on banks’ with bank funding accounting for 94% of total SME finance for both Irish and Northern Irish SMEs. • As at 31st December 2012, total bank finance of €31.5 billion had been extended to Irish and Northern Irish SMEs – €25.7 billion is to Irish SMEs. • There has been a fall in the supply of bank finance in Ireland to include the withdrawal of a number of providers from the Irish market. Total outstanding credit to Irish SMEs was €34 billion at the end of Q1 2010. • Consecutive Irish Department of Finance lending surveys have shown that working capital and cash flow needs are the primary drivers of demand for bank credit amongst SMEs (shorter term debt) as opposed to growth or expansionary finance needs. • There is a lack of balance sheet “right sizing”. In general, Irish and Northern Irish banks need to be more engaged in the debt restructuring or write off of debt for SMEs who demonstrate sustainable trading positions but are over-leveraged due to property or other legacy debt issues. A sustainable SME whose debt has been “right sized” to a level which they can service is a better asset to both the bank and wider economy. • Direct government funding represents less than 1% of total SME finance. The main beneficiaries of this funding are those SMEs who export and those operating in the manufacturing, information and communication technology and tradeable professional and scientific and administrative/ support service sectors. There is limited support for SMEs operating in most distressed sectors outside of traditional bank finance, the Credit Guarantee Schemes (in Ireland and UK) and the MicroFinance scheme in Ireland, some of which, in their early stages, show low levels of take up. • Of those SMEs surveyed who had external finance in place only 2-3% of respondents had other forms of finance in place. Specialist finance houses also provide working capital credit products such as debt factoring, leasing and invoice discounting. Consultations as part of this study have indicated that the take up of such alternative products is low in both jurisdictions. The report stated that Invoice discounting and similar products are often inappropriate for those SMEs whose turnover and thus debtors are falling and the receipts cycle is becoming longer. In those instances, invoice discounting becomes an expensive and more risky form of finance for an SME. • Business finance can also be provided by other nonbank external means. Investment which is made directly from owners, friends and family is notoriously difficult to measure because there are no systems or formal requirements to collect or report such information. Nonetheless, a report published by DCU’s Ryan Academy in 2013 found that about 28,000 family, friends, and colleagues provided money to new businesses in Ireland in 2011. • The second most significant source of funding for SMEs is external equity finance as represented by seed capital, venture capital and business angel finance. External equity finance, including government-backed equity finance, accounted for approximately 5.6% of total SME funding at 31st December 2012, with the proportion significantly higher in Ireland than in Northern Ireland. Total equity finance of €1.9 billion had been invested in Irish and Northern Irish SMEs in the five year period to 31st December 2012, the majority invested in Irish companies. • The Irish venture capital industry (described as vibrant) has received significant and sustained support from the Irish Government over the last few decades. In this time, the Irish Government, through Enterprise Ireland (EI), has committed approximately €348mn to 41 local Seed and VC funds resulting in capital of approximately €1.2 billion for investment in innovative high growth companies. • Results from the October 2011 – March 2012 ECB SAFE survey indicated the significant majority of SMEs believe that equity is not relevant to their business. This is further validated by the results of recent InterTradeIreland and Irish Department of Finance surveys which show that typically, less than 1% of respondents are financed through external equity or have applied for venture capital finance. A general lack of financial literacy exists across the broad financing landscape. A lack of knowledge on alternative funding options is inhibiting the development of a more diverse funding panorama for SMEs and the subsequent use of more appropriate and less costly funding alternatives. Not only is there an over-reliance on bank funding but local SMEs are also more reliant on short term finance, in particular overdrafts and trade credit, in comparison to the EU average. They also still have a significant dependency on cheques rather than funds transfer or other payment methods. • The development of multi-type finance solutions. I hope that you found this two part blogpost on Finance for your Startup useful. For the individual SME or startup, with a lot of hard work and some luck, there suitable finance options available but it is a very competitive process. For Ireland Inc, there are 13 recommendations detailed in this report that should be implemented – particularly R5 to promote alternative sources of finance along the lines of the Growth Loan Fund in Northern Ireland. Good blog Donncha, beneficial to have some data that gives a perspective on VC & Angel funding difficult to see from amongst the trees. Approval is not difficult to obtain from revenue and is then a useful asset that can be leveraged if it’s a means of investment that suits your fundraising – I’ve heard cases where it’s a way of formalising the difficult friends/family investments you mention. There seems to be a trend for it in bigger companies and derisking through own-company investment, which has shifted focus from the original end of the BES where a group of small investors took advantage of a tax break and were incentivised by a future equity option. The EII prospectus is a lengthy process and will cost 2k+, or a percentage of any investment raised, but it is possible to do it reactively – draw up a detailed prospectus after receiving an expression of interest.